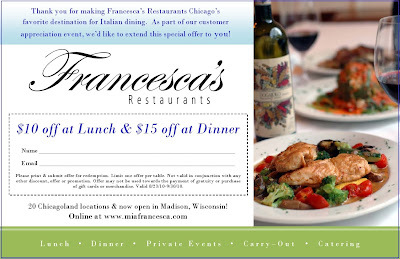 Francesca’s Customer Appreciation Reviewed by Edgeville Buzz on August 27, 2010 . Francesca’s (1039 W Bryn Mawr) is offering $10 off lunch and $15 off dinner as part of their Customer Appreciation event. Simply click the image above, print, and bring it with you the next time you dine thru September 30th. What a great way to support a local business and save a few bucks!